Our discussion of lift truck basics would not be complete without a discussion of center of gravity and the stability triangle. One of the hardest things for lift truck operators to grasp in training is the importance of maintaining their center of gravity within their stability triangle. Simply put, a forklift has a three-point suspension system. It is found over the two front load wheels, as well as the back mid-point between the rear wheels. When imaginary lines are drawn to connect them, this is known as the stability triangle. The operator must ensure that the center of gravity of his combined forklift and load remains within the stability triangle to guard against tip over. Factors such as heavy and unbalanced loads, driving on sloping or uneven terrain, or turning with elevated loads can result in the center of gravity moving outside of the triangle. The result can be catastrophic. To take a step back, one of the greatest risks that a lift truck operator faces is a tip over. Tipovers result in about 25 percent of lift truck fatalities, according to one source. 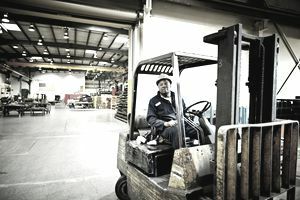 In 2010, OSHA identified about 110 workplace fatalities where the lift truck was identified as either the primary or a secondary source of the accident. As mentioned above, a tip over can occur when the center of gravity moves outside of the stability triangle. This concern must be considered at all times. When it comes to forklift operation, we must be concerned not only with the center of gravity of the load we are lifting but also with the combined center of gravity. This combination includes the lift truck and the load it is picking up. Let’s start by looking at the center of gravity of the load, which is known as the load center. In a uniform load, such as palletized goods or a bale of material, this can be more readily determined. Take a uniform load on a 48-inch long pallet. Then the load center is at 24 inches, which is a common load center for many smaller capacity lift trucks. When a load is uncentered, however, such as perhaps an engine or other non-symmetrical items, then care must be taken to estimate the center of gravity. Likewise, a large load may have a load center much further out than 24 inches. The data plate located on your lift truck will tell you what your maximum lifting capacity is, given a stated load center. If your load center is further out than the load center for maximum lift capacity for your forklift, then your maximum lifting capacity is reduced, potentially dramatically. The lift truck also has a center of gravity, which shifts once the truck picks up a load. When the load is lifted, then the center of gravity moves forward. Care must be taken to maintain the center of gravity within the stability triangle of the forklift, by not lifting more than the maximum allowable, given the load center. When working, stability can be best maintained by keeping loads low to the ground, and traveling with caution when turning, stopping and starting. Also, be sure to wear your seatbelt. One area of particular concern is on ramps or slopes, as well as on uneven terrain. Never raise a load or turn on a ramp. In such cases, your center of gravity will quickly move outside of the stability triangle. Also, keep in mind your center of gravity moves forward when carrying a load. So while traveling empty, your forks should point downhill. When carrying a load, your forks should look to the top of the ramp. A final word, if you are operating a forklift and it starts to tip, do not try to jump clear of the machine. Experts recommend staying in the cabin of the vehicle. Grip the wheel tightly and brace your feet.